The Trademark Universal Notebook Case is an enhanced version of our best selling Universal Computer Case. The result is a stylish, multifunction, large-capacity case that offers you great value at an affordable price. This notebook case provides you superior protection with a well-padded notebook compartment, and convenience with an expanding file folder section, a zip-down workstation and a printer/accessory compartment. The adjustable printer compartment will carry all popular portable printers, full-size binders/day planners or computer accessories. 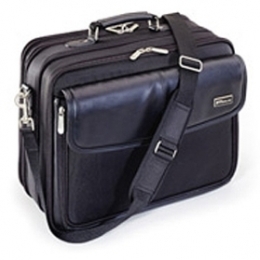 The zip-down workstation includes pockets for your additional files, your cell phone, CDs, and other necessities. Other features include an adjustable padded shoulder strap, heavy-duty nickel fittings, and more!